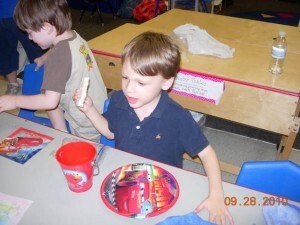 Last week, Cannon had his last days of both AWANA and preschool for this school year. Both have been extremely beneficial to our sweet son in many ways. AWANA, as mentioned in previous posts, is his Wednesday night program at our church. It is set up to have a club atmosphere and his class was called the “Cubbies.” (the 4 and 5 year olds). Every week, they would call the meeting to order and do their pledges. 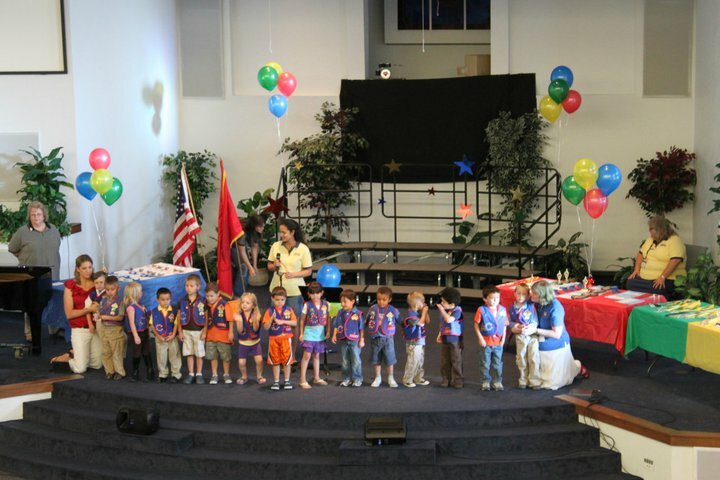 They would choose a Cubbie to hold each item and then pledge to the American flag, the AWANA flag, and the Bible. Then, they would sing some songs. Always the Cubbies theme song followed by other fun Bible songs. 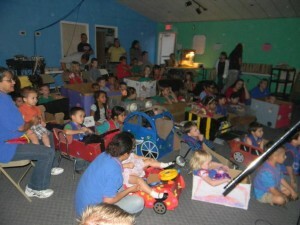 The class would then watch a puppet show and listen to a Bible story. A craft usually followed and the time where they would recite the verse they learned at home for the week. (Patches were earned for their vest when the kiddos completed their at-home lesson for the week and recited their verse. Cannon earned every single one!) After that, to all the Cubbies shear joy, was snack time! 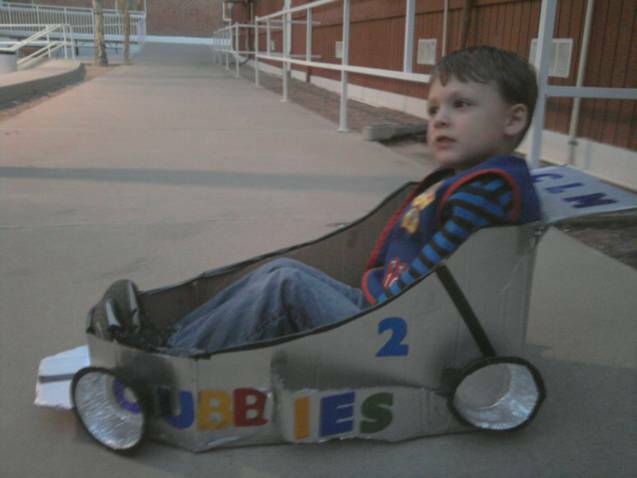 Cubbies was not easy for Cannon, especially at first. He struggled to sit during times that required it. I shouldn’t say struggled…..he just didn’t. 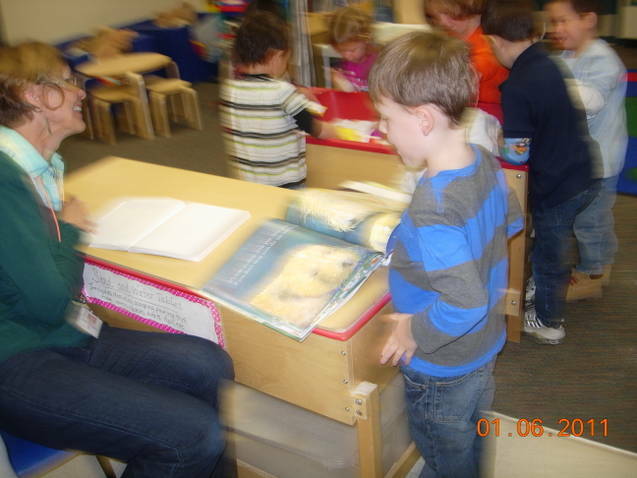 He wanted to run around the room, talk to himself, and play with the toys during the times that no one was allowed to do so. It was tough. I resigned myself, for a while, to allowing him to mill around a small area as long as he wasn’t bothering anyone or anything. Later in the year, we worked up to sitting for longer and longer times. Not one night was easy and I needed to be with him always. But, we persevered and I know that was good for him. We also worked on standing still for the pledges, being quiet and respectful during prayer time, and doing the motions to some of the songs. 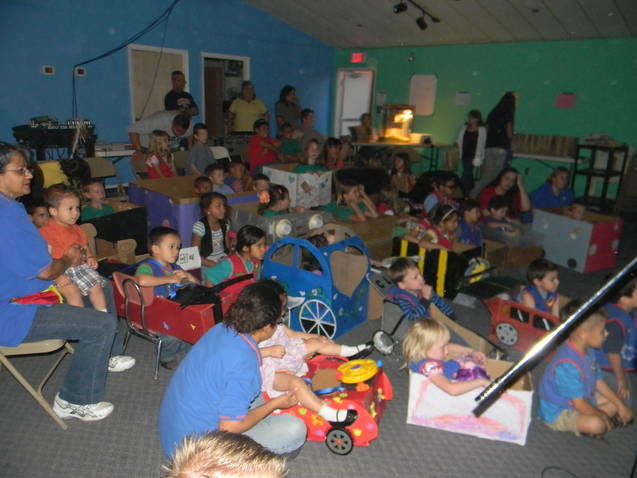 There were many special events throughout the AWANA year for holidays and just for fun. 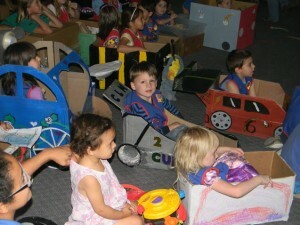 Our favorite was the Drive-In Movie Night. 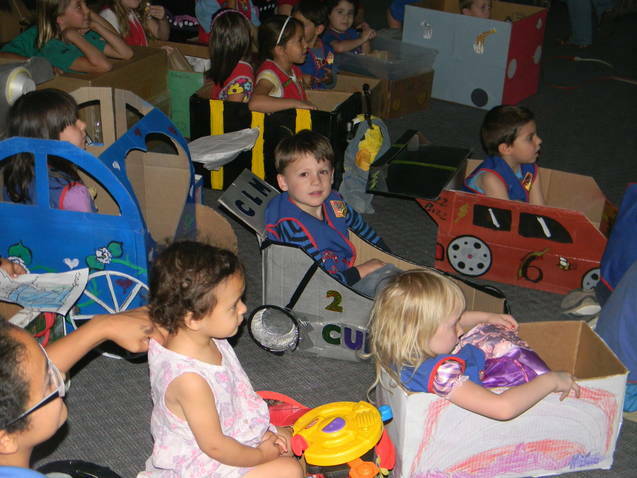 All the kids made themselves cars out of cardboard boxes and watched a movie while eating popcorn with all the rest of the AWANA clubbers. It was a super fun night! The end of the year was capped off with an Awards Night. Each class of kiddos got up in front of everyone in the sanctuary and sang their groups theme song and one additional song. There was a funny puppet show and awards! We had practiced our songs at home and Cannon had them down pat. When we got on stage, he became immediately fixated on the piano next to us. He repeatedly asked to play it and had to be very restrained by me to keep him from doing so. I have to admit I was a little bummed that Cannon refused to do any of the motions or sing the songs he knew so well. So, I helped move his hands the way they should and he stood there like a limp dish rag and with a blank look on his face. I thought that maybe the crowd was freaking him out so I turned him to face me but it made no difference. When it came time for his leader to call him up for his awards, he was growing very agitated. I was holding his hands while on my knees. All of a sudden, at the very moment she called him, he buckled his legs and fell backward konking his head on the stage floor. Nice, right?! We accepted our award through tears. He did manage to say “thank you.” As we waited for everyone else to get their awards and for their parents to come up from the crowd to join them, it became impossible for me to restrain him the way I had been. So, I had to pick him up. I hated doing this because I don’t want him to feel different…..like a baby. But, we have to survive, too. So, I chose to do so. We watched some of the rest of the ceremony. Cannon amused himself by reading the hymnal. This is a very soothing activity for him that he discovered when we visited my parent’s at Christmas. Whenever he would get overwhelmed or over-stimulated…..he would run into the living room where the piano resides, grab the hymnal, and start reading. He flips through the book and reads the titles. It is pretty hysterical to hear such a little person reading things like, “Be Thou My Vision” and “Come Thou Almighty King.” He found the same comfort and coping ability from the hymnal on AWANA Awards Night. It was a great year! Thank you to all who helped make Cannon’s year at AWANA great! Last week also concluded Cannon’s first full year of preschool. 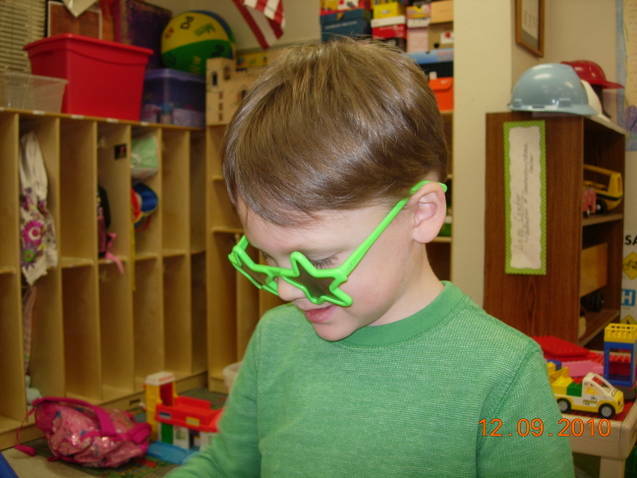 He attended last school year after he turned 3 but only for about 3 ½ months. His class is a peer intervention class that meets 3 days a week for 3 hours. My understanding is that the class attempts to have a 50/50 ratio of kids of average intelligence to special needs kids. He has a wonderful, attentive, caring teacher who really makes us feel so safe and secure when it comes to leaving our precious Cannon. He also has an unofficial aide who worked with him most of the time and helped him cope with the school environment, do specific activities, stay on task, and taught him how to interact with others. 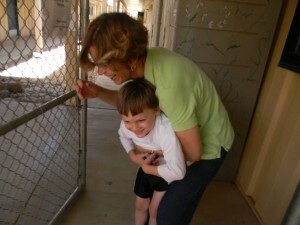 He receives physical, occupational, and speech therapy while at school. Each of these therapies occurs once a week. 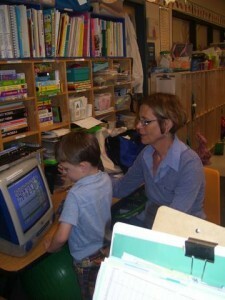 We especially noticed incredible progress this year with the new physical therapist. He works mainly using classic physical therapy, not the sensory integration therapy that our private physical therapist does. He worked with him on climbing stairs, throwing, catching, and kicking a ball, galloping, riding a tricycle, playground equipment safety, and overall safety awareness and visual attention to tasks. Cannon was unable to do any of these things at the beginning of the school year and now is doing them all well or very well. 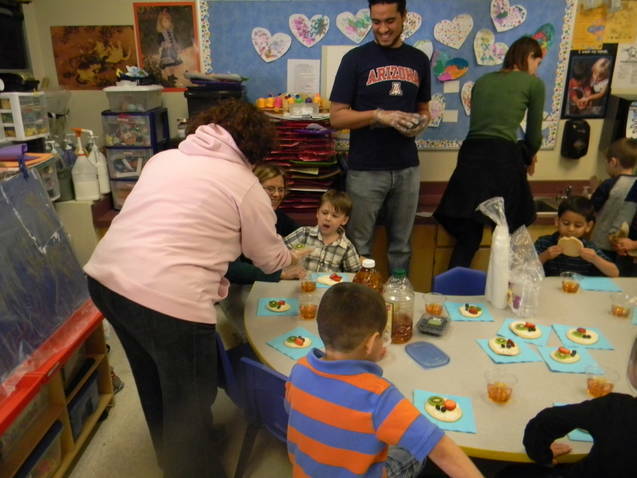 The OT worked with him on things like transitioning from activity to activity without distress, stringing beads, and visually attending to tasks for certain periods of time. 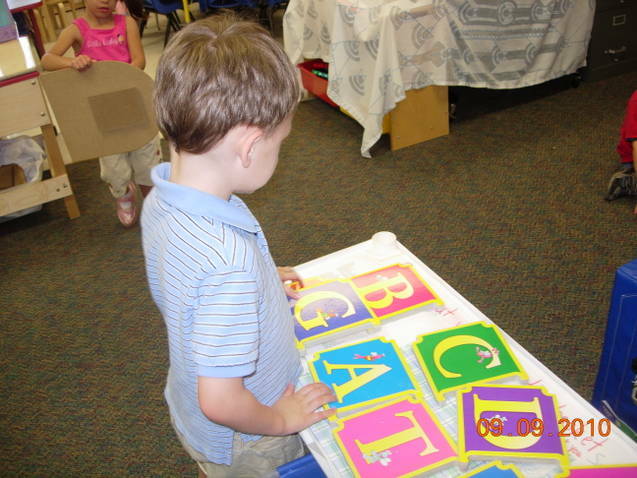 The speech therapist gave him simple goals like being able to use the words “big” and “little” appropriately, stating the function of an object, and understanding negative concepts. The previous year, Cannon had been denied both OT and PT by the school therapists. We met with the principal about the issue. Needless to say, we were thrilled to have new therapists this year who saw how badly he DID need these therapies and cared enough to push him hard towards great results. His preschool teacher packed the year with lots and lots of fun and learning. Above and beyond does not even come close to describing the work this teacher and her staff does! Here are a couple of examples. 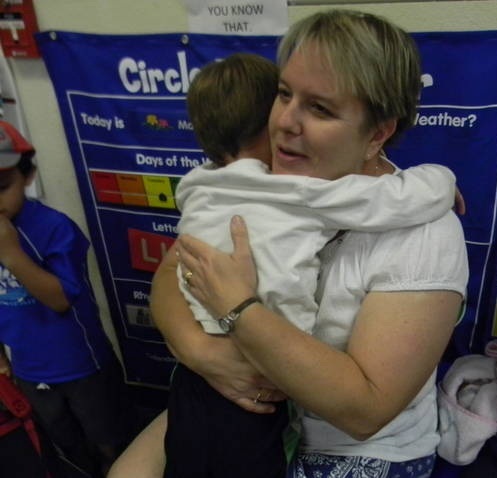 She would meet me (and the other parents, too) at the door to ask how he was doing physically and feeling emotionally each day. And at the end of each day she would give me a detailed report of how things went …..the highs, the lows, etc. This was special to me and also important with all of the medical issues he has had this year. She always let me know when they would be having an event that involved food Cannon’s dietary restrictions wouldn’t allow. So, I could provide an alternative and he wouldn’t feel excluded. She and other members of the staff visited him in the hospital. His teacher also executed a cool idea to help get him to start talking about his day. He was given a notebook that his aide and I would write in each day. I would write before school about what we had been up to that day. We or he would read it aloud and then take it to school. 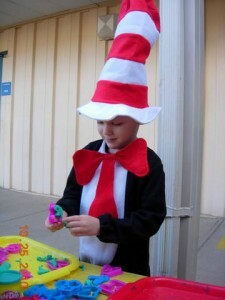 At school, he would read what I wrote to his aide. 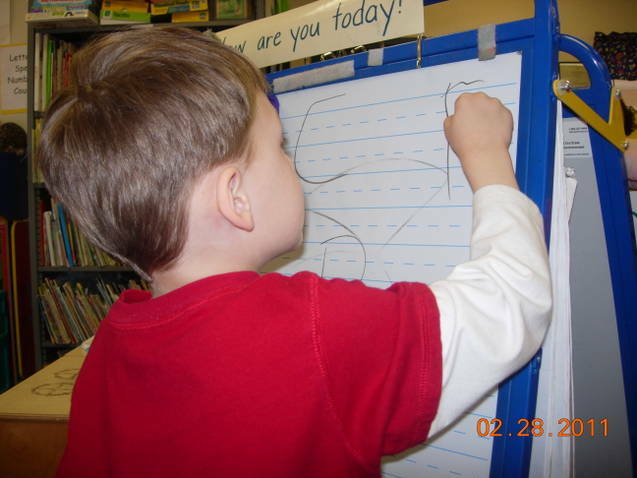 Then, she would write about what they did at preschool at the end of the school day. They would read it together and he would read it to me when he got home. Nice idea, right?! 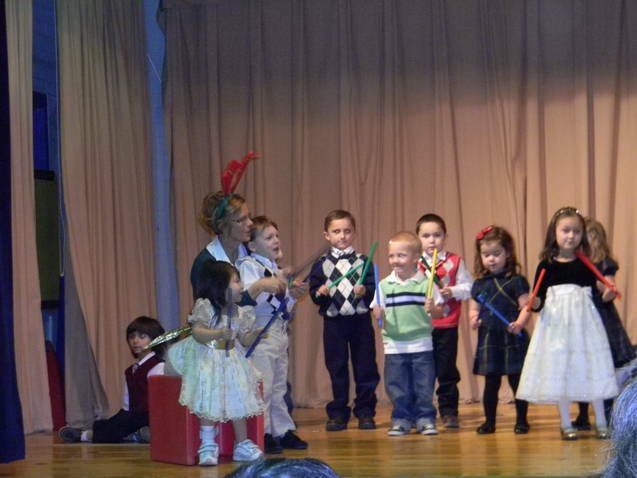 We feel so incredibly blessed to have such a wonderful school environment for our little guy. Here are a few pictures of his preschool year. Enjoy! Thanks for continuing to follow our journey friends!